Two men and several children in a fruit store. 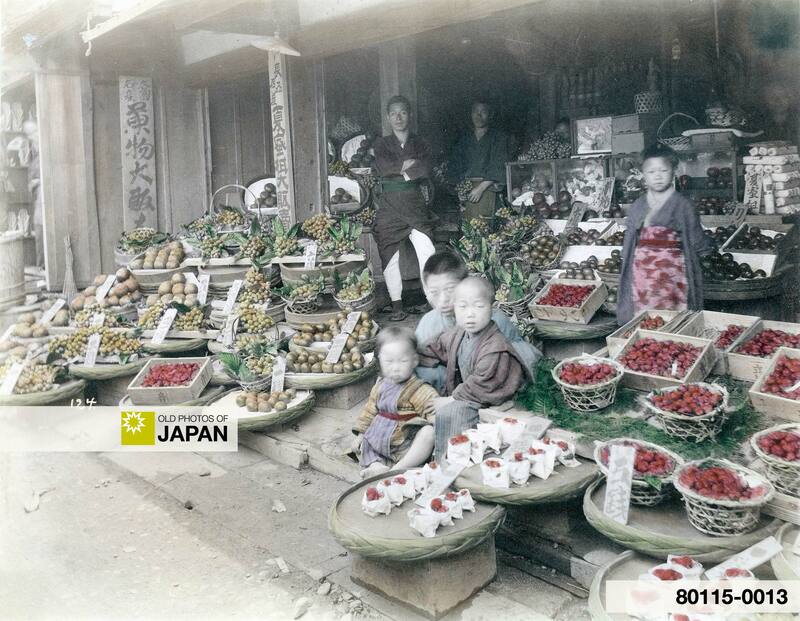 Although this store seems extremely well-stocked, fruit was not as big a part of the Japanese diet as it is today. Commonly eaten were mikan, melon, kaki (persimmon), biwa (loquat), nashi (pear), plum, apricot, peach and apple. In spite of the countless cherry trees, cherries were rare. As were strawberries and most other berries. For more information about Japanese food habits of the Meiji Period, read 1890s • Vegetable Store and 1890s • Fish Shop. You can also licence this image online: 80115-0013 @ MeijiShowa.com.